We are now shifting from the Year of the Goat to the Year of the Monkey. While the Year of the Goat (2015) is a symbol of good luck in the Chinese zodiac, the coming Year of the Monkey (2016) is the sign of creativity and inspiration. 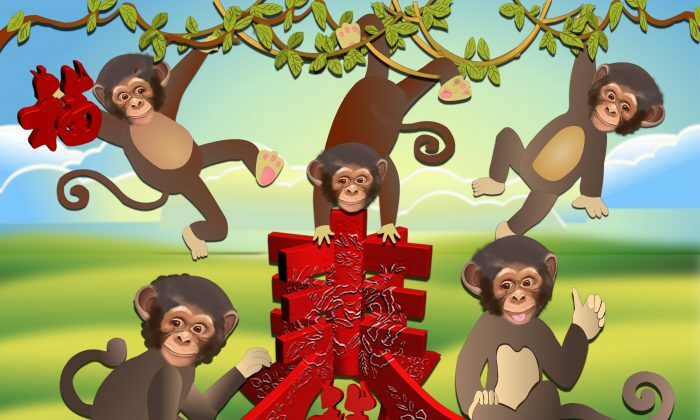 This year, Feb. 8 marks the auspicious beginning of the Year of the Monkey! The Monkey is the ninth of the twelve animals in the Chinese zodiac. Each year is related to an animal sign according to a 12-year-cycle. This can be traced back to 2600 B.C when the mythical Yellow Emperor instituted the first cycle with the rat, ox, tiger, rabbit, dragon, snake, horse, goat, monkey, rooster, dog, and pig. Like their animal counterpart, people born in the Monkey Year are usually smart and amusingly clever, and people are drawn to them. They tend to be intellectuals, experienced and knowledgeable, with excellent memories. They can be good diplomats who can extricate themselves from a difficult situation and create more opportunities for themselves. Their tendency to be mischievous, curious and clever makes them fast learners. They like a challenge and in their careers are excellent performers. Inclined to playfulness, for them practical joking rules the day. Although they are enthusiastic, self-assured, sociable, creative, and lovely—attractive qualities for relationship, they tend to be independent. They are also quick-tempered and see themselves as superior to others. They fall in love easily but have trouble with fidelity. Though playful, their pranks may unintentionally cause harm, hurting the feelings of others. The Chinese character for monkey is 猴 (hóu), which combines the radical 犭for animal and 侯 (hóu), meaning marquis, for its phonetic. China was divided into many small kindoms during the Spring & Autumn and Warring States periods (770–221 B.C.). After conquering the other states to gain control over the region, the Emperor of the Qin State united China and started the Qin Dynasty (221–206 B.C.) At that time, the princes of different kingdoms were all titled as 侯 (hóu), which means marquis or lord. Both characters (monkey and marquis) have the same pronunciation. Monkeys are intelligent animals. Compared to the tiger that is considered the king of the forest, monkeys are not as physically powerful and strong. They lead instead with their intelligence and cleverness. The Chinese character for monkey explains the animal very well, bestowing, then, its auspicious meaning.